How Far is KCee Properties Ashraya? 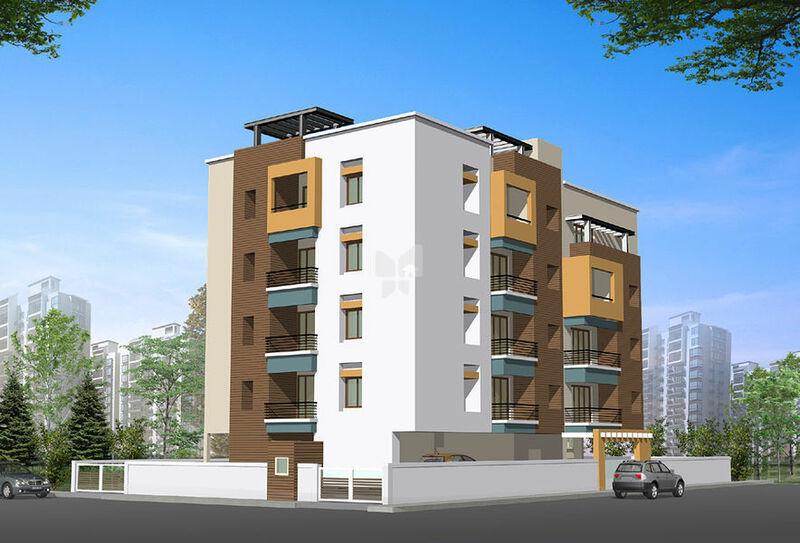 KCee Ashraya is one of the popular residential projects that is located in KK Nagar, Chennai. Developed by KCee Properties, this project offers thoughtfully constructed 3BHK apartments. It is situated close to the market, hospital and various educational institutions. R.c.c. Framed structure shall be designed by leading structural consultant for zone iii earthquake resistance. R.c.c. Columns and beams, all main walls 9”and partition walls 4½”. Plaster inner walls- sponge finish, outerwalls – rough finish. All the door frames are teak wood. The main door will be solid teak door with polish and ornamental borders around the frame. All the window shutter frames are upvc with glass and grills. The internal doors are 32mm american moulded skin doors with paint finish and ss fittings. The toilet doors are frp doors with paint finish on both sides. Granite platform (only l- shape) will be provided with s.s. Single bowl sink with drainboard (36 x 18) or without drainboard (24 x 18) as per site condition. The basic cost of the granite will be rs. 100/- per sft. Additional length of granite platform will be charged extra. Ceramic tile dado of 2 feet wll be provided above counter. For additional tile work rs. 115/- per sft will be charged for the tiles and fixing materials & labour. Service area will be provided with point for washing machine. Tiles will be laid up to 3 feet height dado. For additional height, rs. 115/- per sft will be charged. Lofts will be provided as per the condition of the site. Living, dining, bedrooms and kitchen flooring with 24” x 24” branded vitrified tiles. (basic tiles cost - rs. 60.00 / sft). All other lobbies & staircase will be provided with polished granite slabs as per the architect's design. The drive-ways will be finished with interlocking paving blocks. 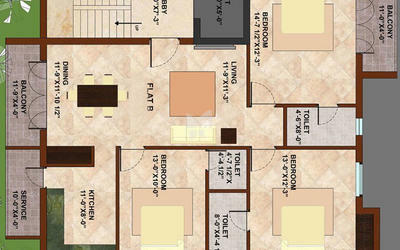 Design tile concepts as per architect’s design. 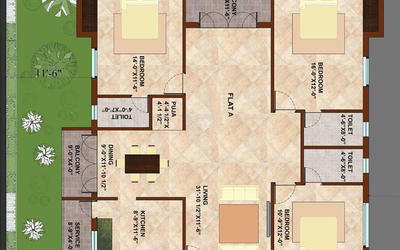 Tiles will be provided upto 7 feet height (basic tile cost - rs. 60.00 / sft). Extra height upto ceiling wall tile will be charged rs. 125/- per sft. One granite counter washbasin in master bedroom toilet will be provided depending on the space availability and normal wash basins in other toilets. Additional counter washbasin in other toilets will be provided on extra cost of rs. 10,000/- per toilet. Branded cp fittings will be provided. Branded sanitary fittings will be provided. Wall mounted closet in all bathrooms. Indian closet will be provided wherever client requires. Outer painting will be apex emulsion of two coats. Inner painting of branded emulsion with cement based wall putty. Main door grill will be provided free of cost. Concealed electrical wiring and branded modular switches. A.c. Power points for all the bed rooms and one either in living or dining. Adequate fan & light points as per the architect's design. Branded cables will be provided. Sufficient panel board with generator change over. Tv, telephone points for all bed rooms and in living or dining. One borewell or well of adequate depth and rcc sump for metro water of sufficient capacity. Overhead tank and sump will be laid with the available tiles internally for easy maintenance. One overhead tank with two compartments for water supply from the borewell / well and from the sump. Ladder facility for cleaning the tank. Granite finish staircase and lobby with stainless steel hand rail. Pest control treatment to be carried out as per national building code to protect from termites. Branded adequate diesel genset will be provided for the entire building including lift and motor but excluding the power points. Fully automatic six passenger johnson/kone lift. Proper weathering course with pressed tiles using lime and brick jelly. Free maintenance period for the products is 12 months. The building will be maintained till association is formed and a maintenance charge of rs. 3,000/- per month will be collected from all the flat owners during this period. KCee Properties is an emerging phenomenon in the real estate landscape of Chennai, with many years of impeccable service, proven expertise and ethical business practices - no wonder we have earned a name as trust worthy property developer among the people of Chennai. The partnership firm was started by two experienced professionals in the field – Kalpana R Shanmugham, a gold medalist Architect from the prestigious Anna University and L. Chandrasekaran, a qualified civil engineer. Their professionalism and steadfast commitment to quality standards and unparalleled knowledge about every nuance of the real estate industry, has enabled our team to make our presence felt in the Chennai cityscape in the shortest possible time. With several multi-structured apartment complexes and real estate ventures KCEE has endeared itself as the top-of-the-mind choice for making investments for both domestic and NRI investors. KCEE’s projects stand a tall testimony to its commitment to quality, eye for details, state-of-the-art amenities, technical prowess, architectural innovation, aesthetic elegance and its passion for excellence. KCEE is fully geared to work towards fulfilling the dreams and needs of its customers by delivering aesthetically appealing, functionally efficient and decidedly up-market real estate solutions. Both partners believe in professional dedication and high ethical standards – approaching all projects with sincerity, honesty and transparency – improving with every project to reach the highest standards set for themselves – converting all clients into lifelong friends.